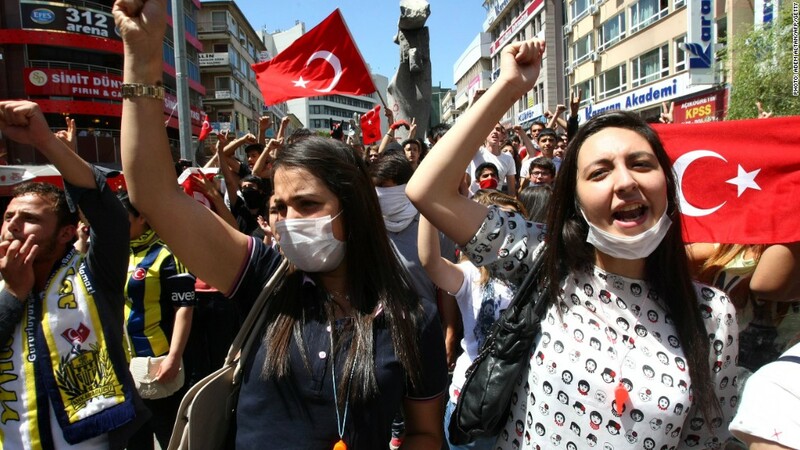 Protesters shout anti-government slogans during a demonstration in Ankara, Turkey. Turkish investors remain on edge as they consider the possibility that protests and unrest gripping the nation for the past week might continue indefinitely. Turkey's benchmark stock index has plunged more than 15% since hitting a record high on May 22. "This is simply a sign that liquidity has completely disappeared in the [Turkish] market," Atilla Yesilada, a financial analyst at Istanbul Analytics, told CNN. "It's tremendously significant. The stock market has lost most of its year-to date gains." The selling intensified this week, after Prime Minister Recep Tayyip Erdogan said he would go ahead with deeply unpopular plans to redevelop a park in central Istanbul. The Istanbul Stock Exchange National 100 Index fell more than 8% Thursday before clawing back to end down 5%. The disagreement over the park redevelopment plans sparked the initially peaceful protests last week that ballooned into the biggest public backlash against the prime minister since he was elected more than a decade ago. The pace of the stock market sell-off suggests "there are now no buyers in the market," Yesilada said. "People are trying to get out with whatever they can rescue." Yields on 10-year Turkish government bonds have also been on a wild ride this week, climbing to almost 8% Thursday, while the Turkish lira weakened against both the U.S. dollar and the euro. However, the debt rating agency Fitch says the anti-government protests do not pose a threat to the sovereign's 'BBB-' rating. "The level of unrest is well within the tolerance of political stability embedded in the current rating, and the economic impact so far is minor," Fitch said in a press release. For days, demonstrators in Istanbul, Ankara and other cities have been calling for the three-term prime minister to quit. They are accusing Erdogan's government of becoming increasingly authoritarian and trying to impose conservative Islamic values on a secular state. Four people are reported to have died, thousands have been injured and hundreds arrested. But according to Turkey's finance minister, the country is doing just fine. In a speech delivered in the city of Ankara, minister Mehmet Simsek said, "Turkey's foundations are strong. Political stability is strong and the macroeconomic foundations will continue to be strong," according to a translation by Turkey's semi-official news agency, Anadolu. Turkish stock markets had been on an amazing run over the past few years, with the benchmark index more than quadrupling since late 2008. --CNN's Ivan Watson and Gul Tuysuz contributed to this report.